Primary Natural Resources gold, phosphates, kaolin, salt, limestone. A LANDLOCKED REPUBLIC and the largest country in West Africa, Mali is bordered by ALGERIA to the northeast, MAURITANIA to the northwest, SENEGAL and GUINEA to the west, CÔTE D’IVOIRE and BURKINA FASO to the south, and NIGER to the southeast. The capital, Bamako, is by far Mali’s largest city, though there are a number of smaller urban areas that include Kayes, Sikasso, Segou, Mopti, Djenné, Timbuktu (Tombouctou), and Gao. Mali’s climate is one of the harshest in Africa, as most of the country is arid or semi-arid: only 4 percent of the country is arable land. Three major rivers run through Mali: the Niger and the Bani meet at Mopti in the center of the country, and the Senegal in the southwest. Mali’s population is among the most ethnically diverse in Africa and is divided geographically north to south. Mande peoples (Bambara, Malinke, Soninke) in the south make up half of Mali’s population; the central areas contain largely Peuls/Fulanis (17 percent) Voltaic peoples (12 percent), and the Songhai (6 percent); and the northern desert is largely occupied by the Tuareg and the Moors (10 percent). The remaining 5 percent consist of minuscule ethnic groups scattered throughout the country. Ninety percent of Mali is Muslim, 9 percent practice indigenous religions, and 1 percent is Christian. 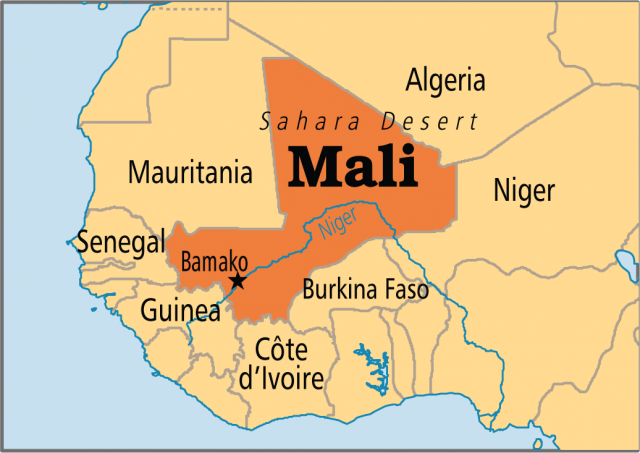 French is Mali’s official language, though Bambara is also widely spoken. Mali has consistently ranked amongst the poorest countries in the world. The country imports most basic resources because of lack of farmland and consistent water sources. While Mali is mineral-rich, economic woes and political struggles have prevented most of those materials from being fully exploited. Mali’s history is among the most ancient in the world, with evidence of civilization from the 11th century B.C.E. Mali was also the seat of the great African trade empires of GHANA, Mali (for which the country is named), and Songhai from the 6th to the 16th century, and its political and economic dominance in West Africa is well documented by Arab geographers, European travelers and local historians. Mali fell into virtual anarchy after the destruction of the Songhai Empire in the late 16th century. The region was briefly united under the Tukolor Empire in the mid-19th century, then was conquered by the French between 1893 and 1898. Mali became part of French West Africa until 1958, though it gained total independence in 1960. Mali since independence has experienced considerable political and economic instability. The country became a one-part socialist state and tried to separate economically from France, which caused a financial crisis during the 1960s. During the chaos that resulted, Moussa Traoré installed himself as dictator in 1968. Severe droughts in the 1970s destroyed Mali’s delicate economy, and led to unrest and escalating conflicts with Burkina Faso and the Tuareg ethnic minority in the north during the 1980s and 1990s. Though Traoré was ousted by a coup in 1991, Mali did not establish a true multiparty republic until the elections of 2002. Amadou Touré, a former interim military ruler, became Mali’s first unopposed elected president.